Anton Henning has re-energised post-modern appropriation painting for the new century bringing it to a new level of complexity. ‘Portrait no. 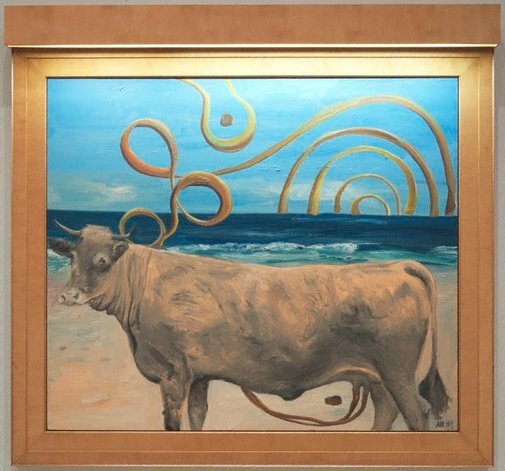 236’ mixes traditional figurative styles with a surreal intervention that creates absurdist connectivity between the cow and the void beyond the horizon. While this is in part a whimsical metaphysical reference it is also a very personal image for the artist. Henning used to spend his holidays with his parents on the west coast of Spain and it was here that he first saw cows wading in the sea to cool off. He also recalls his mother pulling up her skirts to join them in the shallow waves. Somehow the cows and the mother and the milk that sustains, has become an image of an imaginary environmental system. Signed and dated l.r., black oil paint "AH.../ 07". Anthony Bond, Look , 'Landscape not always what it might seem', pg.18-20, Sydney, Nov 2008, 19 (colour illus.). Anton Henning: 20 Jahre Dilettantissmus... , Berlin, 2008, (colour illus. ).